Just two days after BC business groups gathered in Vancouver to declare their support for Taseko's (TSE:TKO) New Prosperity project, mine opponents staged their own gathering. 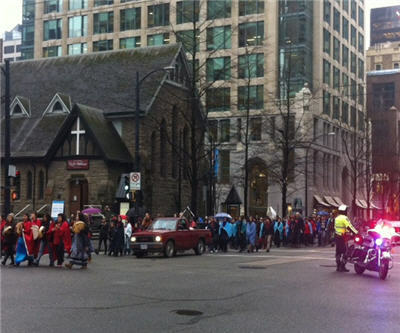 Dozens of protesters blocked downtown Vancouver's busiest street at noon on Friday and marched to Taseko headquarters where police officers were stationed in the lobby. In a press release issued Friday morning, members of the Tsilhqot'in first nation community stated their intent to organize a "flash mob" to demonstrate their opposition to the New Prosperity copper-gold mine in British Columbia's Williams Lake region. The protest comes at a critical time for the New Prosperity mine. BC Minister of Energy and Mines Bill Bennett is currently in Ottawa trying to convince federal law makers to approve the mine. Opponents of the project claim that the mine would pollute Williams Lake and endanger fish populations. Taseko says that the environmental review panel which drew these conclusions was looking at the wrong tailings facility design. The Federal government is currently assessing the $1.5 billion project.